Silk Gimp – Winners Announced! & a Great Big Thank You! Good Morning! And a Happy Saturday to You! Saturday’s a holiday, for the week is ended. Saturday’s a holiday, we can work and play. Well, just be grateful you can’t hear me singing along while I type! I never actually knew if that was a real song, or if he just made it up. 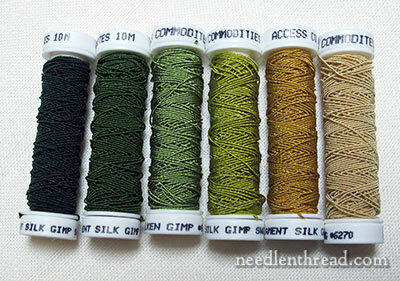 I still have that Saturday-Holiday-Mood feeling now and then – and especially this morning because I get to announce two winners of these Silk Gimp Thread Assortment packs! The winners of the Silk Gimp assortments were drawn randomly. Here they are, along with their responses to my question, What type of project do you envision for the silk gimp? Lesley S from MD, who replied: Oh my, the thoughts of projects swirling in my head! A forest scene does pop to mind first, but the family history embroidery and stumpwork project I’m planning keeps pushing through. D. Katz, who replied: My new daughter-in-law will be spending her first Christmas with us and I want to make her a special Christmas stocking. She and my son were married in front of a backdrop that featured the tree of life, on the wall behind them. I would like to use the silk gimp to embroider this tree on her stocking- the colors would be dynamic! Congratulations, Lesley and D! Please drop me a line with your mailing addresses, and I’ll get those on their way to you as soon as possible. I thought it was funny – as in, funny-coincidental – that both answers have something to do with family. I hope both of you will be able to use the gimp on your envisioned projects! They sound nice. You can find this silk gimp at any locally owned, fine needlework shops that carry goods from Access Commodities. You can try Thistle Threads here in the US, or, in Canada, you might try Traditional Stitches. If they don’t have it, they can probably special order it. Thanks to all of you who responded so thoughtfully to yesterday’s article on the Mission Rose. I really did not intend to stir the pot or raise people’s ire, but I do appreciate all your kind words and support! I wanted to respond to each of you personally, but my email inbox received some three times the number of comments, and I ended up running out of response juice – well, response juice in my fingers and on my clock – but not in my heart. Thank you! If time allows, I’ll do my best to say thanks personally. You’re all such a bunch of dears – I do love my Needle ‘n Thread Family! Congratulations to Lesley & D I hope you both enjoy your prizes you lucky things. I love the words of Saturday’s a holiday if that’s the title I wonder what the tune was I hope you have a happy Saturday Mary and I look forward to the coming weeks posts. Lesley and D, a big congratulations to you both. I love your comments and am really happy for you both, and your families. Google doesn’t give anything about your Dad’s Saturday song Mary. I think that makes it the more lovely as it seems likely it’s your Dad’s own special song for you. Congratulations Lesley & D ! I hope to see you post your projects in Needle ‘N Thread Gallery. Previous Previous post: Mission Rose Update!